Crete is the sensation of beauty and majesty which makes it famous and worth travel for everyone. Crete never stop to fascinate you with all its fantastic style to landscapes or people. Crete is one of the biggest islands of Greece and has the perfect share from the lovely seashores and the mountain villages which stands it out from other islands. Planning a travel trip to Crete on a boat or cruise is the decision of lifetime you would take as this will take you to a slow trip to heaven experiencing some of the finest places on Earth. Special Deals on Car rental in Crete! While travelling to Crete, you would experience not only the landscapes, beaches, treasures of nature and village but also the rich history and culture of people living there. The place provides much importance to its culture and meeting with their civilians will inspire you with their traditions and their world famous cuisine. The famous boat trips to do in Crete would include the following, which should be on your list. Gramvousa is a much famous castle which was built by Venetians, and they have preserved the history of this castle for all the tourists. The castle informs the tourists on how did they save Crete from Turks by building this astonishing castle. Moreover, the flora of Gramvousa Balos includes 400 different types of species out of which 26 are those who can only be witnessed in this part of the world. The fauna of this area is marked to be around 98 species which can be found roaming around as you go by the beaches. Many of these species are threatened to extinct and therefore, requires much care from the tourists too. Balos Bay is the part of the island where beaches go as long as you can see. For availability & tickets follow this link. Chrissi Island in Ierapetra is all about the experience of walking on golden sand, walking through the thick bushes listening to the sound of sea and swimming in the exotic crystal clear water. A boat trip to this island would leave you with an astonishment about the nature Earth. While moving to these islands, you will see the magnificent part of Mediterranean Sea with fresh breeze and smell of Cedar planted there. At one side of the island is a bar which will make up to your craving for drinks, while on the other side is the Orthodox Church and lighthouse, both made according to Crete’s traditions. The experience of people travelling to this Island has been the best due the breeze and peace from the sea. Spinalonga is the smallest kid of the islands of Crete and is one of the most visited ones. Apart from nature, you will find many buildings from the 13th century which is just too hard to store in the condition and yet gives an experience of century’s old stuff. Agios Nikolaos, on the other side, is a patronage provided to the sailors of Greece, and you will find this characteristic all around the island, and the buildings present. While being on this island, you will look into the lives of traditional fisheries and the people living there depending on fishes and seafood. The boats of this place are well received and has lightened all around to stand out in their own way. They make the experience of tourist different from their knowledge of sea and seafood. This place also organises cultural events and music festivals to add some difference to the tourist trip. 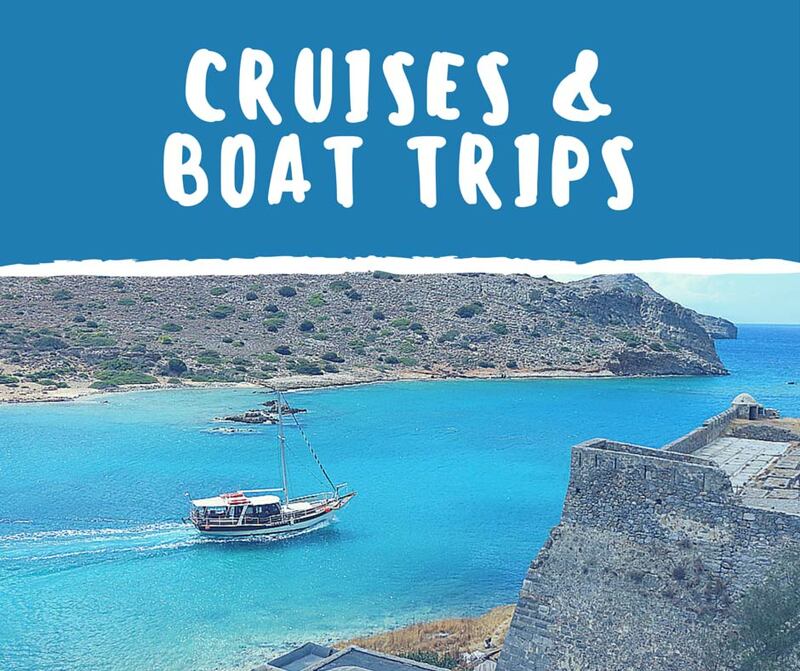 Plenty of companies provide private or group boat trips to Spinalonga from either Agios Nikolaos or Elounda and Plaka. Many of them offer BBQ lunch on the island. Book now a boat trip to Spinalonga from Agios Nikolaos or Elounda Port. If you’re missing the fun on the trip and want to dive into the majestic sea around you, this is the perfect cruise trip for you. Starting the trip from the island of Hersonissos, you will move towards the Sissi. This will be done in Nemo Glass Bottom Boat is an addition to the amount of water you experience on your trip. This boat is glass bottom, and so, you can see all the fishes moving below you and all the fauna available in the sea. Moreover, the boat service provides you with all the snorkelling stuff to make your trip even more fun than it was. You can now enter the sea and play with the fishes while your family stays in the boat. Once you’re done snorkelling, you will also get to see the Saint Barbara, Drapanos and Gourgouthia, some famous places from the history. Read more about schedules and bookings here. This area was the result of a disruption caused by the sea in history and has now left the most beautiful island of Crete for the visitors. The sunsets of the Santorini are considered among the best in the world and so is the crystal water of this area. The colours of the sunset you will see here are unique and breathtaking. There is no one who would visit Santorini and has not complimented the sunsets. Adding to beauty, the area has the food lovers of the world and so the food and wine you will find in Santorini is one of the best stuff from the world. The food by the chef on Kamari Boat is famous for its unique juiciness and yet the elegance of the food. The activities one can find on the boat trip to Santorini is unlimited again. The village has not kept the area only for beauty seeing but has arranged many activities for the tourists as well. You can go swimming, snorkelling, beach stops, thermal pools and more. When you stop off-shore, you can also move forward with visiting the villages, hiking and rock climbing with your friends. It’s an all-rounder experience in your trip. Book your tickets at hellenic-seaways.gr or seajets.gr. You can also book this full tour from Crete to Santorini. This place is more of the trip about connecting with people and knowing more about how lives are in small villages near Sea. This part of the island is covered with little fish harbour and sand beach which is present inside the village. The people are friendly and will take you through all the history available in their area. This area is good for children as the beach normally remains deep and so, you can go ahead and enjoy the water as much you want. The boat trip from Makrigialos to Koufonisi is another great experience you can try. The trip usually takes an hour where you can experience the nature, and once you reach the village of Koufonisi, you can go ahead relaxing on beaches or walking through the tracks. This area is part of an archaeological site, and you can find many sea shells here. If you’re a stone or shell collector, you will love walking through the beaches of these two villages as they’re hub to the sea shells and different stones available on Earth. You can go hiking and mountain climbing and meet the traditional villages situated in the hills and mountains. Click here to book that boat trip. The trip to Crete is an experience of a lifetime with nature and traditional people which make this trip different from your travel buckets. Planning for the next summer trip, you should definitely keep the boat trips to Crete on your list as Greece is a place no one forgets. This entry was posted in Car Rental, Chania, Crete Attractions & Tips, Heraklion, Lassithi on July 4, 2016 .